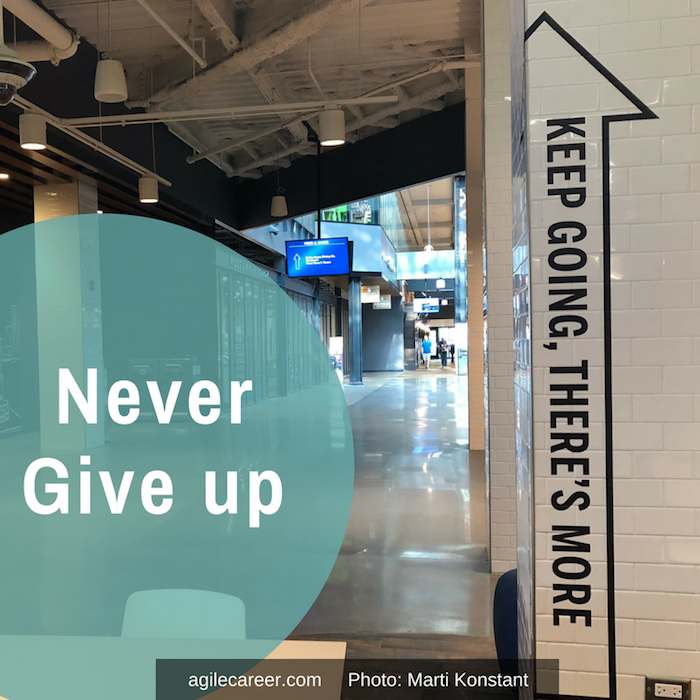 The arc of persistence for career change includes your attitude, actions, and decisions when you reinvent or evolve your current role. You groan and wonder why work is so hard. Most people will suffer in this [career change] pursuit. Almost all will find the journey arduous and confusing over time, many will come to know hopelessness and depression. They will feel defeated and stuck. Even if you stay the course or evolve in place, the road is not smooth. It can feel downright turbulent, like the time you traveled by air in a thunderstorm. You could swear you saw lightning hit the wing causing more concern. But wait, it’s not hopeless! In my life, I want something more. Hating my job is overwhelming. There must be something different. The special ingredients of this stubborn attitude include grit, perseverance, and a resolve to never give up. With 10, 20, or 30 years in front of you and your future career path, you hope all will be well, once you figure how to manage career change with the steel gaze of a super hero. The obstacle course of discomfort precedes a career change. Seriously, this is a good and positive state of being that precedes action. The scenario plays out like this. You are passed over for another promotion in favor of the new guy with limited skills. Or you come face to face with boredom. You find yourself counting minutes and hours, rather than using your brain power for working on something you actually care about. Whether you choose a career change or it chooses you, you will switch from a stable and predictable work environment to an uncertain and unpredictable future and state of mind. Reinvention. Lane change. Transformation. Entrepreneurship. The altered states of your evolution in life and work. These career paths require fierce determination. By the truckload! Words like reinvention or entrepreneurship inspire excitement or terror, depending on your personal needs for stable employment or familiar experiences. Or depending on your ability to handle risk. The arc of persistence is there for you as you fail, run out of money, or simply run out of commitment. You crash. You figure out how to get back to it. At first, you are exhilarated at the idea of freedom and the vision of a successful future. That is, until you encounter a few roadblocks and high stakes decisions. Unless you stick with the same set of skills in your career and possibly the same employer, you will experience the angst of venturing into the unknown. And even if your career path has been certain to date, you will eventually find yourself at a crossroads. A right of passage for your work life. Fear not, however, it’s not you; it’s the career journey. Lane changes to a new industry or a different size company can be rough terrain, riddled with potholes. My personal career change includes artist, designer, marketer, author, and career agility researcher. These days, my research topic is agility of all flavors in addition to delivering presentations, workshops, and consulting services. While there is a thread that ties these skillsets and interests together, the personal growth required between roles was frequently painful. Like that evening MBA program, while working full-time. It was a necessary requirement to shift from position of designer to marketing professional. Or the time I owned a marketing communications business for nine years (physical location, staff, etc.) before earning the position of tech executive. The business was a nine-year roller coaster of contracts, business loans, long-term leases, staff recruitment, staff management, and full-on sales. Who knew the business of design required significant back office operations and non-stop sales efforts? Regardless of satisfaction or milestones achieved in design and marketing, I wanted something more and different. Yearning to make a difference in the world of work on an individual level, I wanted to increase positive work experiences and lessen the pain of career growth. I became a student in my new area of interest, conducting research, and creating career agility tools. Tenacity, in spite of difficulty was required at multiple decision points. And now, after finishing my five-year double duty existence juggling the roles of marketing consultant and career growth analyst, I officially made the leap to a new career lane. 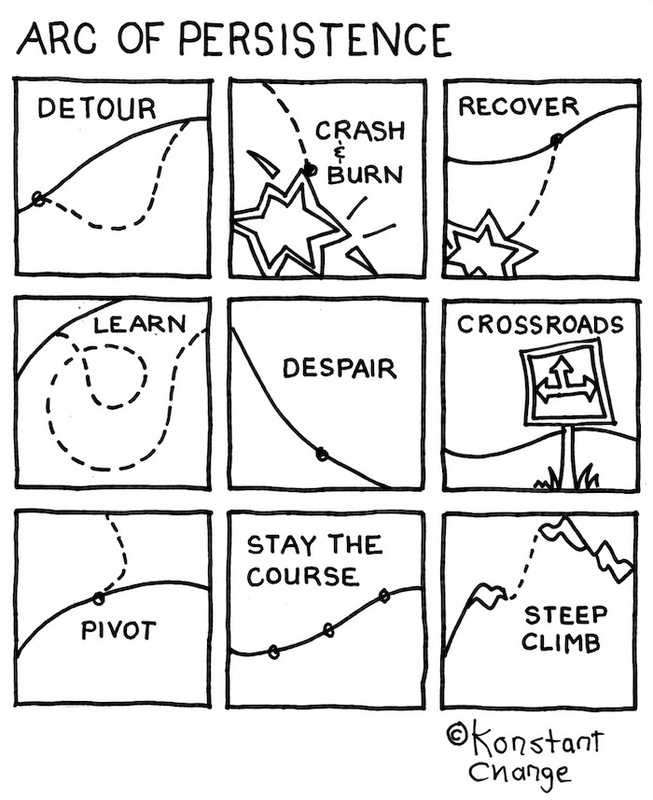 Although I’ve written a book about careers and how to respond to change, the growth curve for my role is steep. My journey highlights challenging events. Yet, my personal career path is full of promise. The mountain climb from marketing exec to author, career growth researcher, consultant, and trainer hovers at 10,000 feet, ready for the next ascent. Her book title, Option B: Facing Adversity, Building Resilience, and Finding Joy, coauthored with psychologist Adam Grant, summarizes her attitude. As a woman in Silicon Valley among the titans of tech, she worked her way through the management ranks. She weathered corporate storms within Google and now as COO of Facebook. As the title of her book suggests, she made it her mission to move beyond loss after the sudden death of her husband, Dave Goldberg. Walt Disney’s path included newspaper artist, animator, and theme park visionary. Imagine being criticized for what you thought was your strength! Some of his projects failed and he ran out of money more than once, yet he continued to expand his thinking based on larger than life ideas. He believed in dreams. Business leaders like like Meg Whitman, Chris Gardner, Carly Fiorina, and Michael Bloomberg suffered from being fired from their jobs, yet continue to move mountains in their professions and good causes. In conclusion, persistence pays off. What challenges define your personal career story?